"If a Mom has been listened to throughout her labor and throughout her birth, then she will have a positive experience. If she feels bullied into a c-section or if she's bullied into a natural birth, she will not have good feelings about her birth. But if she made the choice at every step along the way she will be empowered and she will feel strong. And that's when we know a doula's done her job, when a Mom feels that." 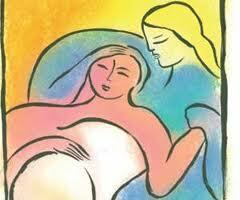 The word doula is a Greek word that means women’s servant. Women have been serving other women in childbirth for centuries and have proven that this support from another woman has positive effects on the labor process. A doula is professionally trained in childbirth, provides emotional, physical and informational support to the mother who is expecting, in labor or has recently given birth. The doula's role is to help women have a safe, memorable and empowering birthing experience. Most doula and client relationships begin a few months before the baby is due. During this time, they establish a one-on-one relationship that gives the mother complete freedom to ask questions, express fears and concerns, and take an active role in creating a birth plan. In adition, most doulas make themselves available to the mother by phone to answer questions or explain any developments that may arise in pregnancy. Doulas do not provide any type of medical care. However, they are knowledgeable in the medical aspect of labor and delivery so they can help their clients get a better understanding of procedures and complications that may arise in late pregnancy or during delivery. During delivery, doulas are in constant, close proximity to the mother at all times. They can provide comfort with pain relief techniques, such as breathing, relaxing, massage and laboring positions. Doulas also encourage participation from the partner and offer reassurance. A doula acts as an advocate for the mother, encouraging her in her desires for her birth. The goal of a doula is to help the mother have a positive and safe birth experience, whether the mother wants an un-medicated birth or is having a planned cesarean birth. After the birth, many labor doulas will spend a short time helping mothers begin the breastfeeding process and encouraging bonding between the new baby and family members. Women have complex needs during childbirth. In addition to medical care and the love and companionship provided by their partners, women need consistent, continuous reassurance, comfort, encouragement and respect. They need individualized care based on their circumstances and preferences. Doulas are educated and experienced in childbirth and the postpartum period. We are prepared to provide physical (non-medical), emotional and informational support to women and their partners during labor and birth, as well as to families in the weeks following childbirth. We offer a loving touch, positioning and comfort measures that make childbearing women and families feel nurtured and cared for.